Nerve damage in diabetes is characterised by tingling and pinprick-like sensations, and pain and numbness in the hands and feet. 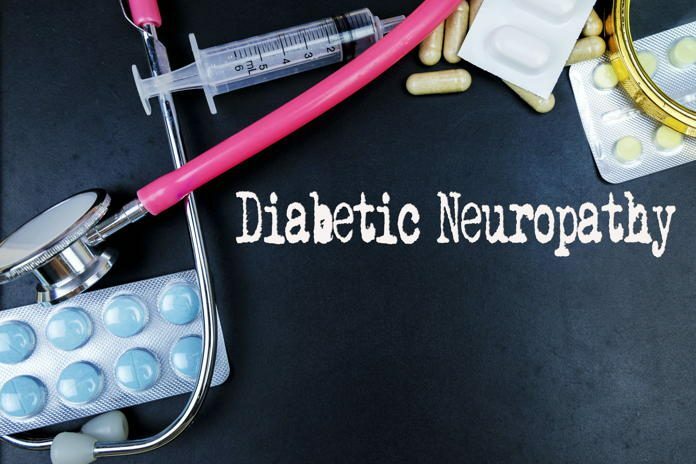 More commonly known as diabetic neuropathy, it is, in fact, one of the most common complications of diabetes caused by sustained high levels of blood sugar in your body. In this article, we will talk in detail about peripheral neuropathy. Peripheral neuropathy is damage that affects the nerves in the peripheries, which are your arms and legs, causing tingling, pain and numbness. These symptoms first affect the feet and then the hands, and gradually spread to the entire limb. The sensation is similar to that of wearing stockings or gloves. Physicians also call this the ‘stocking-glove’ pattern. Some people may become overly sensitive to touch. As the symptoms develop gradually, you may not even notice them until they become severe or complicated. Who is at risk for peripheral neuropathy? How does peripheral neuropathy develop? Researchers are yet to conclusively determine the exact mechanism of how peripheral neuropathy develops. However, there is no doubt that high blood sugar levels are the main culprit. Recent studies show that apart from high blood sugar levels, metabolic disorders and changes in blood vessels high blood pressure, excess body fat especially around the waist, and high cholesterol levels also contribute to the development of peripheral neuropathy. Unfortunately, there is no cure for diabetic neuropathy. Your doctor may prescribe medications to relieve the symptoms, such as pain relievers, anti-seizure medication or antidepressants. Topical treatments in the form of creams or ointments such as capsaicin cream can help relieve the symptoms. The best way to prevent further nerve damage is to manage your blood sugar levels. Get as much exercise as you can. Exercise will not only relieve pain but also improve your mood. Walking, gardening, doing house chores, and any moderate activity counts as exercise. Take good care of your feet. Gently cleanse your feet every evening; dry them thoroughly and moisturize them. Check for cuts, blisters, or wounds on your feet regularly; if present, get in touch with your doctor immediately if there is a delay in their healing. Invest in a pair of good shoes. Your shoes have to be comfortable and roomy. Avoid heels and flip-flops. Limit sugary and fatty foods. Eat smaller portions but eat frequently; have at least five meals a day. Avoid fruit juices as they have less fibre and high sugars. Fruits such as fresh berries, oranges, and apple in limited quantities are beneficial. Avoid high carb vegetables such as potatoes and corn, and have greens such as lettuce or spinach as they are high in fibre. But no vegetable is completely off limits. Shift to whole grain foods. Avoid processed foods, like chips, biscuits, ready-to-eat meals, etc., as much as possible. Transcutaneous Electrical Nerve Stimulation (TENS) is a procedure in which a gentle electric current is delivered via electrodes attached to the body. Physiotherapy is also helpful in relieving neuropathic pain. You may ask your doctor for suggestions. Apart from these, some yoga asanas can help increase blood circulation in the body, especially to the feet. If you don’t have any experience with yoga, it is best to take guidance from a certified yoga instructor. Yoga will not only help with pain relief, but it will also help in keeping you active, relieve stress as well as increase your self-awareness. S.Trivedi, A. Pandit, A., G. Ganguly, G., & Das, S. K. (2017). Epidemiology of Peripheral Neuropathy: An Indian Perspective. Annals of Indian Academy of Neurology, 20(3), 173–184. M. Zychowska, E. Rojewska, B. Przewlocka, J. Mika. Mechanisms and pharmacology of diabetic neuropathy – experimental and clinical studies. Pharmacological Reports. (2013) 65, 1601-1610. ISSN 1734-1140. American Academy of Neurology. Understanding Peripheral Neurology. Loved this article? Don't forget to share it! Disclaimer: The information we share is verified by experts and scientifically validated. However, it is not a replacement for a doctor’s advice. Please always check with your doctor before trying anything suggested on this website. 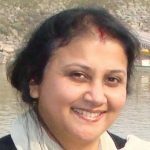 With extensive experience in health content writing and research background in the field of histochemistry, Mita has the skill to translate research papers into a simple and comprehensible language. Being a type 2 diabetic herself, her aim is to get as much info on the disorder as possible. Wellthy therapeutics gives her the platform to share this knowledge with its readers. When she is not glued to the computer, she spends time reading classics in print, gardening, and spirituality. What Is A Dangerous Blood Sugar Reading, And What Should You Do About It? Tips To Get Healthier Everyday! The Wellthy Magazine is on a mission to become India's go-to destination for all things diabetes! We provide you with credible information rooted in research that has been verified by experts. द वेल्थी मैगज़ीन भारत में डायबिटीज़ से जुड़ी तमाम तरह की जानकारियों को एक जगह मुहैया कराने के मिशन पर है. हम आपको विश्वसनीय और रिसर्च पर आधारित जानकारी प्रदान करते हैं, जिसे विशेषज्ञों द्वारा सत्यापित किया गया है.